Minister for State Enterprises, William Duma, was suspended from government in February this year, after it was alleged he had a beneficial interest in a lucrative land deal made with Kumul Consolidated Holdings. Peter O’Neill ordered an administrative inquiry into the affair, led by John Griffin QC. In a PNGi exclusive, we reveal the testimony of a senior Paga Hill Development Company (PHDC) executive, who claims the suspended Minister will potentially make a significant financial windfall from the proposed K3 billion luxury development at Paga Hill – which is said to include a 6-star hotel and potentially a casino. The high level executive claims a confidential cooperation agreement was entered into with William Duma during June 2015, by PHDC. It will see land acquired by Duma at Paga Hill, form part of this major property development – known as the Paga Hill Estate – slated to host APEC 2018. PNGi will chart how William Duma came to obtain land at Paga Hill, and it would appear, a valuable interest in what has been dubbed one of the ‘country’s biggest public-private partnership projects’. Image: Panaoramic harbour views, several minutes walk to Town, Paga Hill is a developer’s dream. The largely untouched land on Paga Hill’s south-west face was described in 2002 by the consultancy firm, Anvil Project Services, as ‘the best large single (land) parcel in PNG, if not the South Pacific’. With panoramic harbour views, just a stone’s throw away from Port Moresby’s Central Business District, it is easy to understand why. The south-west slope is divided into two core plots. First, there is portion 1597. It was acquired by the Paga Hill Development Company in 2000, through a process which the Public Accounts Committee claims was marked by ‘corrupt dealings’. Adjacent to portion 1597 is five allotments – section 26, lots 16-20 – which according to a senior PHDC executive, William Duma owns through Kopana Investments Limited. Kopana was incorporated in 1999. William Duma is its sole owner and director*. Up until October 2009, Kopana Investments Limited was an inactive shelf company. It then entered the real-estate sector. A search of National and Supreme Court decisions, reveals a 2012 case involving Kopana Investments Limited, and 5 allotments at Paga Hill centring on the 2009 period – although the case does not provide the allotment particulars. Therefore, PNGi can not confirm that the 5 allotments at Paga Hill featuring in this Supreme Court case are the same 5 allotments at Paga Hill the subject of an alleged Cooperation Agreement with PHDC. But given the probability of this link, it is worth detailing the Supreme Court decision. According to Justices Davani, Canning and Kariko, Kopana Investments acquired state leases over 5 land portions at Paga Hill on 25 November 2009. Reflecting on the transactions behind this acquisition by the then Minister for Petroleum and Energy, the judges observe, ‘there are serious issues as to fraud’ – although they were not asked to make a final determination on this matter. The Supreme Court bench argued this after it was revealed during trial that the Lands Minister, Puka Temu, exempted the lots from public advertisement on 14 September 2009. Two weeks later, on 29 September 2009, the Land Board recommended that the 99 year state leases be awarded to Kopana Investments ‘a company owned and controlled by a person who appears to have been a ministerial colleague of the Minister in whose name these various decisions were made’. Following this acquisition, after having a mere K1 of assets in 2008, by 2009/10 Kopana recorded assets of K4 million. In 2011 this leapt to K28 million, with a modest K5.6 million in liabilities. The cause of this abrupt spike is unclear, but it is an exceptional achievement for a company with only 2 part-time employees. 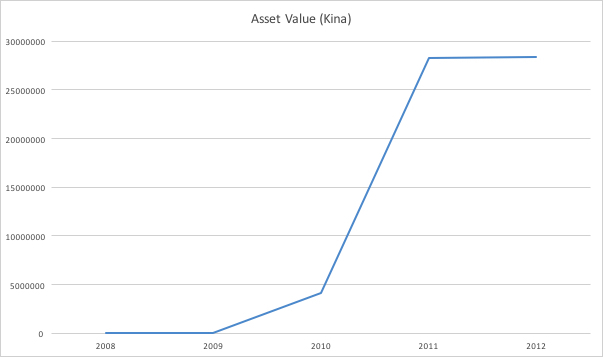 Table 1: Kopana Investments Limited’s Assets 2008-2012 (Source: Kopana Investments Limited Annual Returns for the years 2008, 2009, 2010, 2011, 2012). Like many politicians, Duma appears blessed with the Midas Touch. * Investment Promotion Authority records suggest Kopana Investments Limited has not submitted annual returns for 2014, and 2015, which if accurate, is an offence under the Companies Act 1997, with directors being liable for fines of up to K10,000 under section 414(2). Anvil Project Services (2002), Information Memorandum: Paga Hill Estate, Port Moresby, Papua New Guinea, Waigani: Author. Public Accounts Committee. (2007). Public Accounts Committee Report to Parliament on the Inquiry into the Department of Lands and Physical Planning, Waigani: National Parliament of Papua New Guinea, p.60. Kopana Investments Limited, Company Extract, Investment Promotion Authority, accessed on 1 July 2017. Kopana Investments Limited, 2012 Annual Return, 28 June 2013. Kopana Investments Limited, 2011 Annual Return, 29 June 2012. According to Investment Promotion Authority records, Paga Hill Development Company (PHDC) is a local firm, legally owned by Stanley Liria, a lawyer from the Southern Highlands. 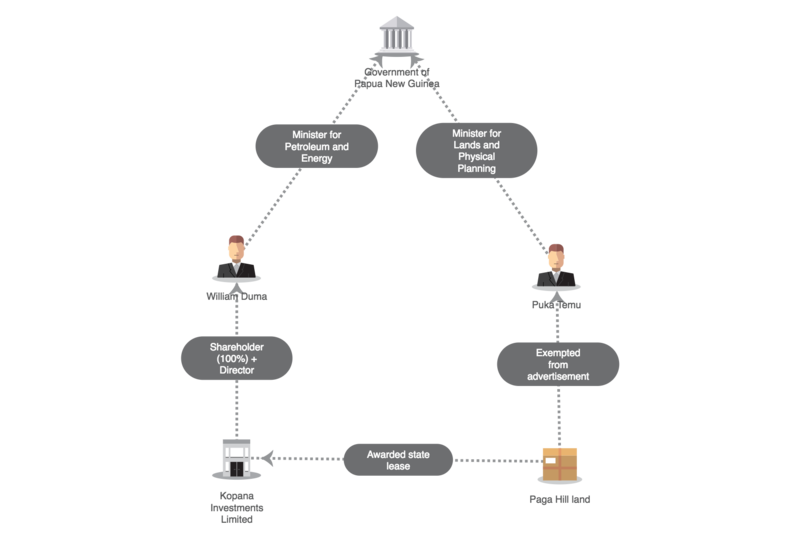 However, the formal share registry cannot be relied on as an accurate statement of all beneficial interests in the Paga Hill Estate, which may be held through various private arrangements, such as a Trust agreement. 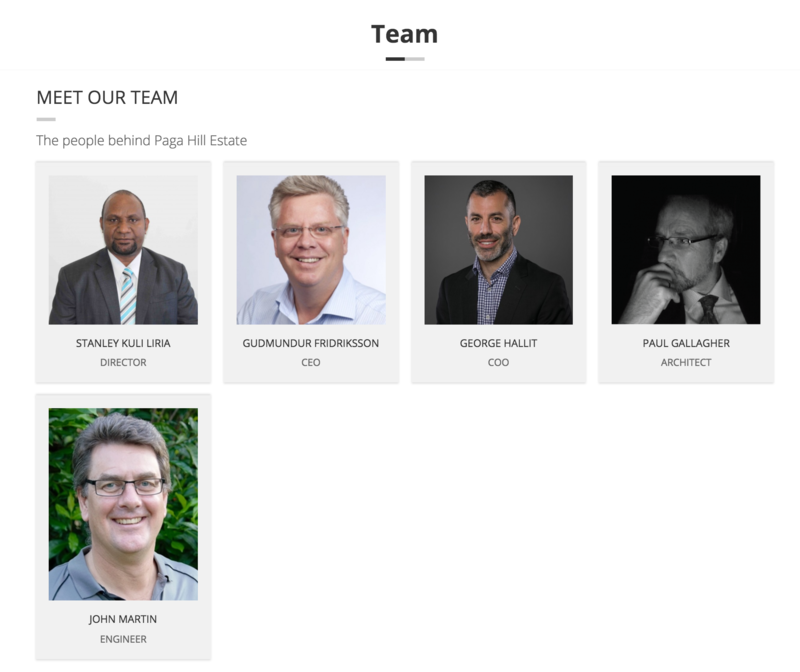 Screenshot: The Paga Hill Development Company Limited executive team (http://www.pagahillestate.com/team/). In 2016, there was an unusual set of filings with the Investment Promotion Authority, relating to the Paga Hill property development. A company Malaga No.7 Limited was incorporated on 3 March 2016. It became a fully owned subsidiary of Kopana Investments Limited on 8 March 2016. On the same date, William Duma was appointed company director. Just under a month later on 5 April 2016, PHDC acquires Kopana Investments Limited shares in Malaga No.7, with Gudmundur Fridriksson, Stanley Liria, and Zhongqin Shi replacing Duma as director. An Investment Memorandum issued by PHDC in January 2017, indicates that Malaga No.7 Limited holds a 93 year state lease over land at Paga Hill. 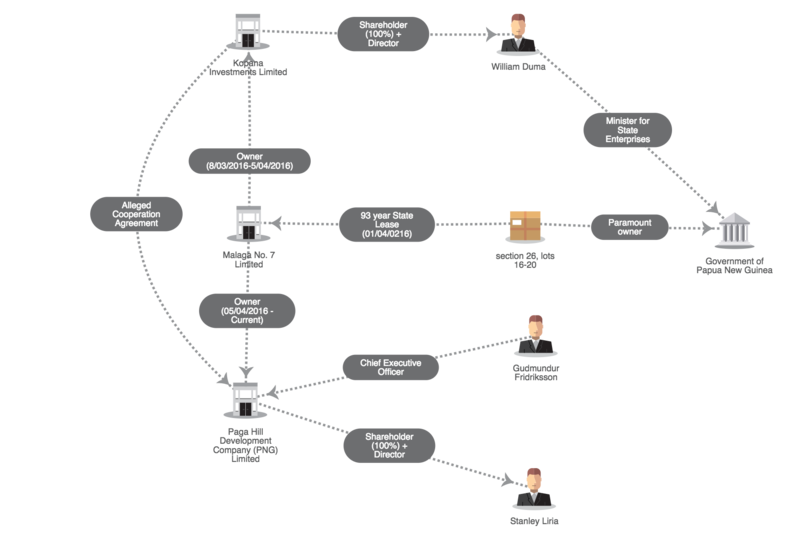 PNGi can now reveal a potential explanation for this set of transactions, based off testimony provided by a senior PHDC official. According to this high level executive Kopana Investments Limited’s land holding at Paga Hill – Section 26, Allotments 16-20 – borders the proposed Paga Hill Estate development. Its incorporation in the project, the senior management team believe, is essential to the proposed K3 billion venture. During June 2015, Kopana Investments and PHDC allegedly entered into a Cooperation Agreement. Under the agreement, Kopana Investments would avail of its land to the project, in return for net equity in the development, once completed. The executive claims matters were complicated by the Paga Hill Ring Road, which snakes around Paga Hill’s southwest face. As a result of its construction, state leases over affected land had to be reissued to take account of the new infrastructure. Kopana Investments Limited’s five allotments were amalgamated into Section 26, Allotment 32. A 93 year state lease was then issued to Kopana Investments’ subsidiary, Malaga No. 7, beginning on 1 April 2016. To meet Lands Department requirements, PNGi is informed, it was essential that the state lease was issued to the original owner, Kopana Investments, or a fully owned subsidiary. It appears the new state lease awarded to Duma’s subsidiary, was a striking deal. Ordinarily, rent on state leases is set at 5% of the land’s unimproved value (Land Regulation 1999, section 3). PHDC corporate records indicate the annual rent owing on Section 26, Lot 32, is K30,936. Unless a special exemption has been given by the Lands Minister, it would seem the land at Paga Hill is valued at K618,720. 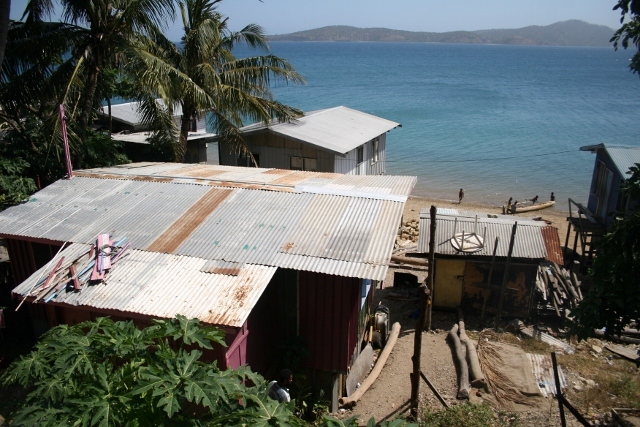 This would be a bargain price for a prime plot, almost 1 hectare in size, on the shorefront of Port Moresby harbour. For example, in a scholarly review of Port Moresby’s land and property market, The National Research Institute found that the average price, per hectare of land in the adjacent Town area was K29,854,000. Following the June 2015 Cooperation Agreement reached with Duma, PHDC anticipated it would take control of the titles to Section 26, Allotment 32, once reissued, under the notably generous terms acquired by Kopana Investments Limited. This took place through a share transfer on 5 April 2016, which made PHDC sole owner of Malaga No. 7. The PHDC executive contends the precise split of equity that will be awarded to Kopana Investments for its landed contribution to the property venture will be agreed at a later date, once the development is complete, and all liabilities met. If this testimony is accurate, it would appear that State Enterprises Minister, William Duma, has acquired beneficial interest in a major public-private property development. It is also probable that this occurred employing land awarded to Kopana Investments under questionable circumstances during 2009 when he was Minister for Petroleum and Energy. Change of Shareholder (share transfer) (Form 13), Investment Promotion Authority, filing date 30 March 2016. Change of Shareholder (share transfer) (Form 13), Investment Promotion Authority, filing date 5 April 2016. 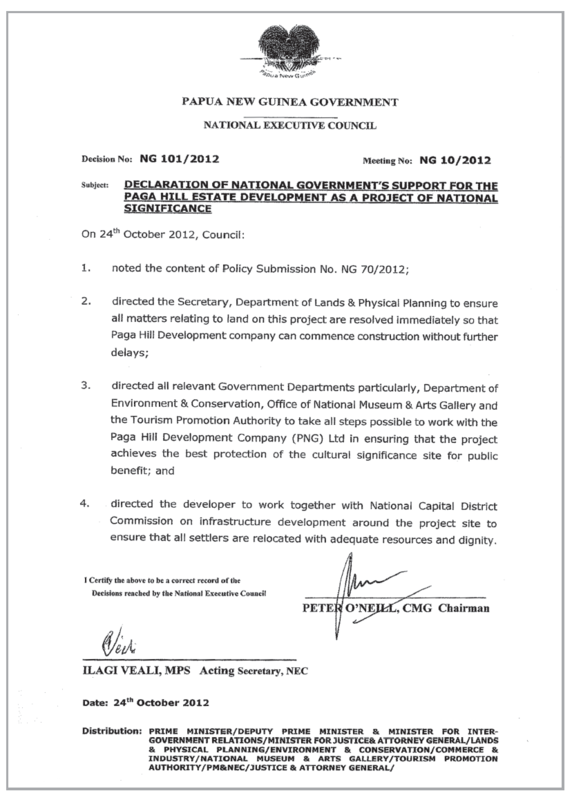 Paga Hill Development Company (PNG) Limited. (2017). Information Memorandum, Port Moresby: Author. Since the property venture’s inception, the Paga Hill development has enjoyed strong national government backing. National government support extends back to 1997 when the then Tourism Minister, Michael Nali, agreed to lobby the National Executive Council (NEC) to declare the venture a project of national significance. Nali subsequently acquired a stake in PHDC, after he left office, through his company Kwadi Inn Limited, which he evidently relinquished last year to Stanley Liria. This declaration of national significance was renewed by the NEC on 24 October 2012. In the NEC decision, signed by Prime Minister O’Neill, it is stated: ‘All matters relating to land on this project are resolved immediately so that Paga Hill Development company can commence construction without further delays’. More recently the project is said to have been dubbed Port Moresby’s ‘tourism city’ by the Minister for Trade, Commerce and Industry. In December 2016 it was announced that the national government has signed a memorandum, formalising its role in the venture. According to The National, the Tourism, Arts and Culture Minister, Tobia Kulang, labelled the property development ‘one of the country’s biggest public-private partnership projects’. 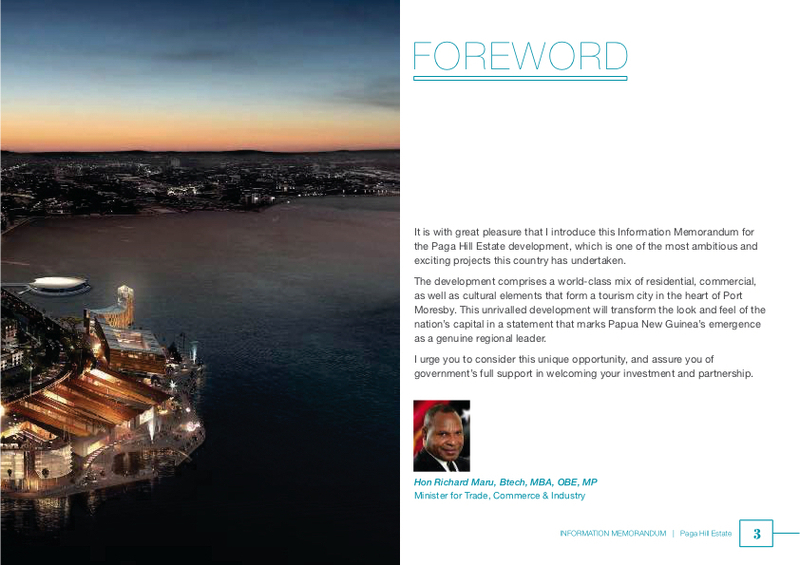 PHDC claims it has, ‘signed a Memorandum of Understanding with the PNG Tourism Promotion Authority, Port Moresby City Authority (NCDC) and the Department of Trade, Commerce and Industry to support the development of this landmark project’. Prime Minister Peter O’Neill is quoted as stating: ‘My Government declared Paga Hill Estate a “Project of National Significance” in 2012 and in late 2015 approved Paga Hill as a key project site for APEC 2018 with fiscal incentives to its partners and investors’. The developer argues: ‘PHDC have secured the site on a long term state lease with Master Plan and Environmental Impact Study completed and all approvals obtained. The project is now a fully approved Integrated Resort and large-scale, high-end residential and marina development. The recently added casino element is in the process of government approval’. The developer points to another joint project with the national government, facilitated by the venture: ‘Located within the Cultural, Exhibition & Convention Centre will be the National Hospitality and Tourism Training Academy. A joint initiative of the National Government, Hotel, Hospitality and Tourism operators and overseas supporters of PNG’. Finally, the company claims, ‘the PNG Government is currently considering the establishment of a Special Economic Zone (SEZ) framework for Paga Hill Estate and branding the site as a tourism gateway to Port Moresby and PNG as a whole. The process is being championed by Hon Richard Maru, OBE, MP, Minister for Trade, Commerce & Industry, who is a strong advocate for the development. The establishment of a Special Economic Zone (SEZ) would compel all relevant State Departments and Agencies to work proactively and closely with PHDC in establishing the SEZ, assisting to avoid any unnecessary delays to the development of preliminary components ahead of the 2018 APEC summit. The State is also expected to commit to providing PHDC with applicable and appropriate relief such as import duty and tax duty concessions. SEZ benefits for Paga Hill Estate will be underpinned by incentives for direct foreign investment for the construction and realisation of Paga Hill Estate, which will constitute key infrastructure for the city, stimulating the economy during its construction and ongoing operation’. Of course, following public acrimony between Prime Minister O’Neill and William Duma, and Justin Tkatchenko and PHDC, it is unclear whether these ambitious claims will materialise in tangible results. Minister for Civil Aviation, Culture and Tourism. (1997). Letter from Hon. Michael Nali, Minister for Civil Aviation, Culture and Tourism, to Mr Byron Patching, Manager, Jones Lang Wootton International Property Group, Central Plaza One, 345 Queen Street, Brisbane, 4000, Australia, 27 February. Notice of Change of Shareholder (share transfer) (Form 13), Investment Promotion Authority, filing date 22 December 2011. Change of Shareholder (share transfer) (Form 13), Investment Promotion Authority, filing date 2 September 2016. Ikuavi, J. (2016). ‘Tourism city’, Post-Courier, 20 December. A range of organisations and individuals have asked why the government continues to support the Paga Hill Estate, given the parlous track record of its key proponents, including PHDC’s controversial CEO Gudmundur Fridriksson. In October 2012, a report issued by the International State Crime Initiative, revealed that senior executives spearheading the Paga Hill venture ran businesses censured in 4 x Public Accounts Committee reports, 2 x Auditor General reports, and 1 x Commission of Inquiries (subsequently, 2 further Commission of Inquiry citations were uncovered). The committee also argued that an Urban Development Lease and a Business Lease awarded in 1997 and 2000 respectively, were in violation of the Land Act 1996. It appears Duma’s entry into the public-private consortium underpinning the Paga Hill Estate is no less controversial. The Supreme Court has raised red flags over the conditions under which Duma originally acquired land at Paga Hil – although it did not specify the name of the 5 allotments. Furthermore, the annual rental charged on the land’s unimproved value, if set at 5%, would indicate the property is significantly under-valued. Furthermore, the Minister’s interest in the Paga Hill Estate is secured, a PHDC executive claims, through a private agreement, which is not available to the public for scrutiny. 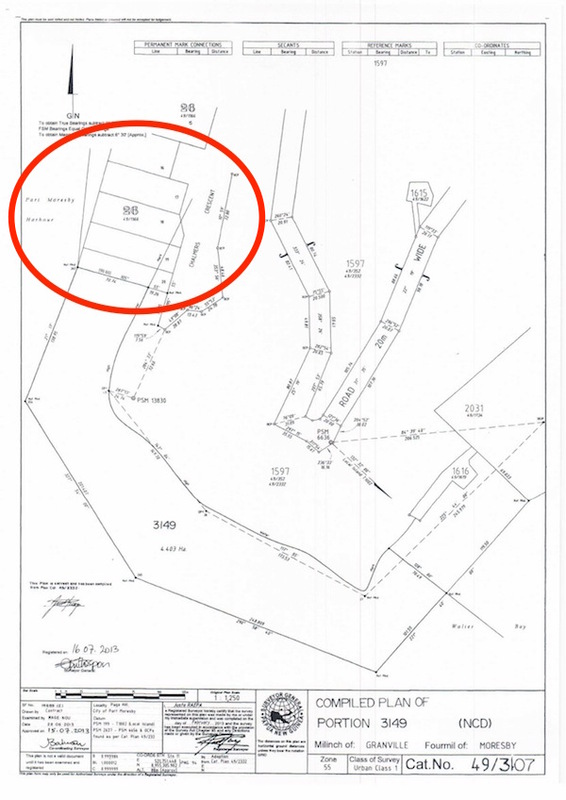 Why was prime land on the harbour foreshore exempted from advertisement, and awarded to his company? Why was annual rent on his landholding levied at such a modest rate? Will Mr Duma make public the Cooperation Agreement signed with PHDC, so his beneficial stake in the public-private venture may be scrutinised? Has he recused himself from all governmental decisions relating to the Paga Hill venture, noting explicitly his conflict of interest? Has this beneficial stake in Paga Hill Estate been included in his annual statement provided to the Ombudsman Commission? While the public awaits the results of the administrative inquiry into Duma’s alleged acquisition and sale of land at Manumanu – which was due to be tabled in parliament on 28 March 2017 – it would appear this deal with PHDC is equally deserving of judicious review.